This Sunday at practice BEFORE the barony meeting there will be an archery tournament as well !!! While this tournament is NOT to choose the archery champion of this fine barony it is for an archer to represent this barony in the Second Annual Scarlet Guard Challenge at Hornwood Scarlet Guard Inn!!! This tournament will start around noon and be hosted by me. Ideal participants are those already planning to attend Hornwood. Bring your A Game everyone , I’d really like it if the Debatable Lands could dominate this challenge for a few years like has been done with the 7 pearls. 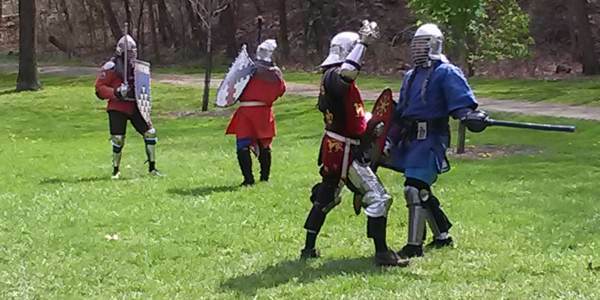 Heavy fight practice will be held, starting around 2:00 (pending the end of the Barony Meeting) this Sunday. In addition, don’t forget that the tournament to decide the new Baronial Heavy Weapons Champion will also be held. All fighters, belted and unbelted, are eligible to compete. See you there! Weather permitting, there will be youth fighter practice this Sunday from 2-5pm at the corner of Washington Blvd. and Allegheny River Blvd. in the East End of Pittsburgh, map here: https://goo.gl/maps/MT1eSkgMDPu. I will be marshalling while Mistress Fredeburg is unavailable. There will be loaner gear. If your youth fighter has not yet authorized, NOW is the time to do it! The AEthelmearc Kingdom Youth Championship Tournament is next weekend, May 21st, at AEthelmearc War Practice. We will be pressed for time before the tourney, so the more kids are authorized ahead of War Practice, the better! The forecast is for rain so keep an eye on this list for updates in case of cancellation. Weather permitting (as in ground not being mud and not raining) there will be dancing. Going forward there will be dance at every Sunday martial practice ( so not during War Practice etc) again weather permitting. I look forward to dancing with you all, no experience needed, all dances will be taught and called. Youth combat practice will be held at our outdoor site on Washington Blvd, Sunday starting at 2 pm. Loaner gear will be available. Heavy practice will happen at the usual time and place this Sunday at 2 PM at the Washington Boulevard site. Yes, it’s Mother’s Day… so have brunch with Mom and then come out to practice. Mom wants ya to fight… really! There will be heavy fight practice on Sunday May 3, beginning at 2 PM at the Washington Boulevard sight, weather pending. Please check the baronial email list and the Facebook page for updates based on site conditions. 2. The forecast is for showers turning to thunderstorms by evening. While light rain won’t deter us (especially since with temps predicted to be in the 70s), the practice site has historically been prone to flooding so heavy rain may cause a cancellation. As Knight Marshal, Sir Isenwulf will make that call. Check this Facebook page and the barony email list for any updates. Fight practice will be held this Sunday, March 27, beginning at 2 PM at the Environmental Charter School, 829 Milton Ave in Regent Square. I asked Robert to run the practice, thinking I could not make it, but it turns out I will be there also this week. Eat your Easter candy and then come out and burn off the calories with us!